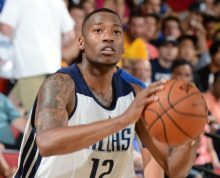 The state of Florida on Wednesday dropped a two-month-old charge of attempted first degree murder with a firearm against professional basketball player and Campbell alum Eric Griffin. The state said the case was “not suitable for prosecution.” Griffin will now attempt to continue his pro career after being falsely accused of a serious crime and having his reputation damaged severely. Griffin, 26, and Daquan Lundy, 23, were arrested in late April for an Orlando-area shooting that involved 24-year-old Treavor Glover. Glover survived the episode and told authorities he believed it was an act of revenge tied to an April 16 drive-by shooting that killed Gino Nicolas and Tanya Skeen, according to the incident report. An attempted murder charge against Lundy was also dropped Wednesday. According to the incident report, Glover said a man who appeared to be 6-foot-2 and another man who appeared to be shorter than 6-0 waited for him to arrive at the Bala Sands apartment complex and fired shots at him. Glover ran toward the back of the complex and fell. Glover told authorities that the taller man stood over him and shot four times from close range, hitting him in the forehead with one shot. Griffin is 6-9, at least seven inches taller than either person described by Glover in the incident report. The defense team also contended in court that there was proof of Griffin’s innocence. “The defense has in their possession some motion detector videos that apparently show the defendant as well as the defendant’s stepfather inside (their) house during the period of the shooting,” attorney Natalie Stratis-Malak said last month, according to WFTV video. WFTV reported that defense attorney Eric Barker said he had records showing that the house alarm was set before 11 p.m., about two and a half hours before Glover was shot, and that the alarm was not disarmed until 5:51 a.m. the next day. Barker said Griffin couldn’t have left the house without triggering the alarm. Griffin, who grew up in Orlando, played one year of high school basketball and attended two junior colleges before enrolling at Campbell. He played for the Camels from 2010-12, averaging 15.7 points, 8.6 rebounds and 2.4 blocks as a senior. Griffin played in the NBA Summer League each of the last four years and performed well for the Dallas Mavericks in 2014 before averaging 19.0 points, 6.6 rebounds and 2.4 blocks for the NBA Development League’s Texas Legends, a Dallas affiliate. Griffin appeared on the rosters of the Los Angeles Clippers, Cleveland Cavaliers and Detroit Pistons during the 2015 summer league, but Detroit waived him early in the NBA preseason. Griffin played in Dubai during the 2015-16 season, and the arrest eliminated an overseas opportunity for this summer.